When we moved into our house we had more space than we could have dreamed of. With just the two of us, three bedrooms were more than enough. We had a guest room that was empty most of the time and a spare room that was just waiting for a little baby to move in. 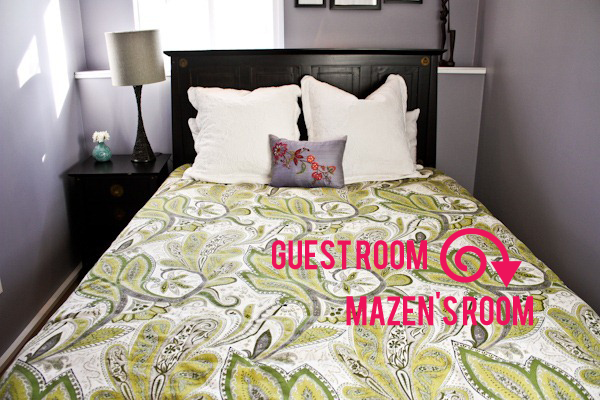 Shortly after Mazen was born, in the midst of a hormone frenzy, I had a minor freak out: “We are out of bedrooms!! !” Our house, now filled with baby gear, felt a lot smaller. “We need to move before I get pregnant again! Or now! !” I thought. Of course I wasn’t thinking rationally. We do have somewhere for a baby to go. Families with many more children live in much smaller homes. Two kids could share a room. 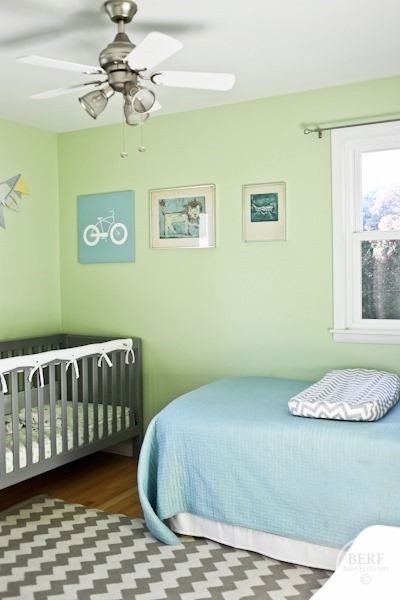 Or another baby could take over the nursery and Mazen could move into the guest room. We have guests just a few weeks per year, so it seemed silly not to use that room full time if we needed it. Neither of these solutions is ideal for the long haul, but we love our house, yard, neighborhood, and mortgage so moving isn’t ideal either. I went as far as to have a contractor come and look at our attic to see if we could expand up. It’s a walk-up attic, and I had grand dreams of a master suite up there so two kids could share our middle floor bedrooms. I even created a Pinterest board to convince myself attics could be transformed into beautiful open spaces! But the contractor took one look at our attic and said (I quote) “You can’t pay me enough to tackle this project.” I guess it needs more structural work than I had thought. We also discussed an addition off the back, but with our lovely porch taking up half of the house, the configuration just isn’t ideal. Large-scale renovating is just not feasible (plus we don’t exactly have the funds to pay for an addition in the near future!) So I concluded that we either had to love it or list it. This post on living simply by one of my favorite bloggers, Ashley, also came at the right time. We needed to embrace our place. Once I had a plan (because I am a planner) I felt calm again. We are going to love every inch of this house until we are ready to move into a four bedroom home years down the road. Our plan is for Mazen to move into the guest room (which is in the basement and makes his grandmothers nervous) whenever we have another baby, say 2-3 years from now. We’ll get a fold-out couch for our family room to use for guests. The guest bed will go in the attic, creating more space for Mazen’s room, and the twin bed that’s in the nursery will become Mazen’s. Follow me? With the “love it” plan in full force, we decided to give the room we spend the most time in a face lift. We dipped into our house savings account and chose to upgrade the counters, backsplash and paint. Next up: phase 1 – paint. Ooooooh, can’t wait to see what you did to the kitchen! Good attitude! It’s fun to see what a little creativity can do! Argh Kath! I want to see the photos now! You have such a great eye for decorating so I can’t wait to see what you did. I love the green walls in the nursery! If there’s one thing that life in Paris has taught me, it’s that we don’t need all of the space that a few years ago I would have considered essential. I have friends who live with a baby in a 500 square foot apartment! omg I LOVE that show! I also love what that contractor said… haha probably not what you wanted to hear but it’s a funny story! My parents turned our walk up attic into a recreational room, and left part of the attic for storage. “I wouldn’t get out of bed for less than $1,000 a day”. Price around for an enthusiastic one who is excited by the challenge. We just had our son 3 months ago, and we live in a tiny 2 bedroom house….for 11 years it was just my husband and me. Now we’re definitely feeling more cramped than ever. We decided to go ahead and update our kitchen and bath anyway….we figured even if we move in the next few years at least we will love our space (and add value to our house). Can’t wait to see your kitchen updates! I’m so curious about the paint color you chose! Definitely a fan of living simply in a small space over giant houses! I think it’s great that you’re embracing the house you have. Can’t wait to see a pic of the kitchen with the new upgrades! Love it or list it on HGTV is on of my favs! We are embracing our three bedroom house too. With baby #2 on the way we will just do without a guest room. In reality, it’s not that big of a deal. When guests do stay with us (which hardly ever happens) we can just let them have our master and we can sleep on couch or on floor in one of the girls rooms. Problem solved. Can’t wait to see the changes you guys are making. So fun! I’m glad you decided not to move, you have a great backyard and porch! Do you know where you got the blue quilt in Mazen’s nursery? I’ve never seen a Homegood, but it looks like maybe it is similar to TJMax which we have in the West. Yes it is! It is actually part of the same company. TJMaxx, Homegoods, and Marshalls. Take the home part of TJMaxx and make it an entire store. =) It is my favorite place! Can’t wait to see the kitchen renovations! I agree with the grandparents. I would never put a small child in a basement bedroom. Too difficult for a little one to get out safely if ever needed, even with a good egress window. We have a walkout basement with door and I still would not use it for a child so young. Otherwise, looking forward to seeing your kitchen update!!! I think your plan is great as you only have guests a few times during the year! We also bought a 3 bedroom house and hope to have 1-2 children and I figure the kids can give up their bedroom for a few nights if necessary for visitors and bunk with the other kid. Can’t wait to see your kitchen redo. After buying our house we upgrade just about everything in the kitchen and love how it turned out! Can’t wait to see the kitchen reno! You’re right – I should ask around. I think though that even if we did it it would cost more than it’s probably worth in our house. But I should still research more! I was going to say … don’t give up. 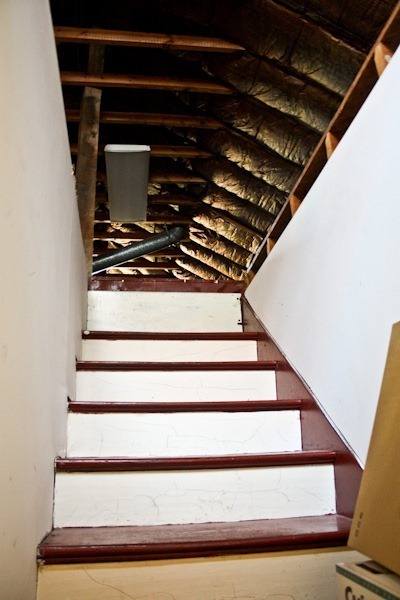 Our last house was built in 1890 and the previous owners converted the attic to a master bedroom area. It was amazing – open, quiet, etc. Check with some more people! Kath great idea to just stay put for now. You can always move later. We live in a 922 sq ft urban apartment with no storage, no basement, and it’s cramped but we make it work. I love the light, central location and other things or I would move to the burbs and have more space. I’ve given up the notion of ‘guest rooms’. Guests can stay on couches or in hotels; we need every square inch for our family’s full time, day-to-day needs. We rarely have them though so it’s not a huge issue. Your kitchen is beautiful! I love when you post stuff about your home! I just love your style. I am in this exact same position in our home! Well, sort of. We have a 1000 sf 2 bed, 1 bath with an unfinished basement… AND my husband works from home (which, in our state, legally requires full use of one room to get the tax write-off). We quite literally have no space for current guests or a future babe unless we finish the basement (and put my husband’s office down there). We are trying to “love it”! Thanks for the link to the Dwelling Small article! I’m also excited to see your kitchen, ours has the EXACT same shape/size/layout! Our house was built in 1939, and all the older houses we looked at had small kitchens! Just curious, do you have a microwave? Ours in currently on the counter and takes up so much space. I thought about over the stove, but I really like how you have pans hanging there! What a clever post! I can’t wait to see how the kitchen turns out. I think you’ve come up with a perfect solution for your home. My sister and I shared a room for a while when my parents used the other room as an office. But they didn’t have a proper guest room until we were both out of the hose and it worked fine 🙂 Love your home, so much character! My sister and I shared a room most of our childhood. We are 18 months apart which may be better than kids who are 3-4 years apart. When we got older, my parents gave up the bigger bedroomso we had room for 2 desks and more space for each of us to call our own. Yes let’s hope the show is listening!! I’m sure you’ve already thought about this and probably someone else already commented about it, but I wanted to add my two cents about moving Mazen to the basement. I am the oldest of 3, and when my youngest sister was born I moved from my bedroom upstairs to the bedroom downstairs. i was terrified! I was scared at night of the noises and the fact that everyone else was upstairs. I moved downstairs when I was 8 and for the first year I slept in my brother’s room. I worry about moving Mazen downstairs that he may be scared–I would have a back up plan of where his “temporary” bedroom will be while he transitions. My parents had planned that I wouldn’t be old enough to sleep downstairs so they had my brother’s room set up for me. Looking back I don’t think there was any problem with moving downstairs when I did. I enjoyed having my own space when I was awake–it just took me a while to sleep there! But I know you can make it work and have your house for a long time! From the pictures you show, it is very cute and warm! We moved our bedroom downstairs and put our second child in our room when she came along. Makes me wish we’d have paid more attention to bedrooms when purchasing! Does your basement bedroom have an egress? otherwise I’d never put anyone down there, particularly a small child. there’s nothing wrong with two children sharing a room until you can afford a house with more bedrooms. It’s not about your comfort. It’s about their safety. It has 2 windows in the bedroom and a door to the outside too. The door is in another room but the bedroom has 2 windows. They are also ground level so he would have no problem just jumping out. It does make me nervous though. I know this sounds alarmist, but you might want to think about whether, in an emergency, a four-year-old could break the glass in one of his bedroom windows and then use his limited upper-body strength to pull himself up onto a ledge to crawl out. Also, I’m assuming you have a bathroom in your basement? Or would Mazen have to make his way upstairs in the middle of the night to go pee? You’re so talented with your decorating and I cannot wait to see the end results! I’m so excited to see the kitchen redo! I’ve been waiting for that to show up on the blog. 🙂 That attic looks like it has amazing potential with the right contractor. For what it’s worth, I’ll share that we have 5 kids in a 1700 sq ft house with 3 bedrooms and 1 bathroom. The 1 bathroom is a bit tricky and we plan to add another one next year. But otherwise the house works great. I have friends with way bigger houses and they feel like they exist to be caretakers of their houses. It’s more space to spread out, true. But it’s also more space to clean, decorate, pay taxes on… many of them want to downsize. When we have guests, which isn’t often, we move kids around to provide a guest space. We also have a sleeper sofa in the family room. I can’t justify a dedicated guest room for the few days a year that we need one. 🙂 I figure we’ll set one up someday when the kids have moved out. I had the same freak out when I found I was pregnant with our second child. Our son is only 17 mos so they will be 21 months apart. We decided to keep the queen guest bed in the new baby’s room. Thankfully it is big enough…barely. I would like to move in about 3-4 years right before my son starts school. Truthfully the thought of getting and keeping a house “staged” to sell with my little tornado and pregnant makes me never want to move. Thanks it’s from Pottery Barn. It was a wedding gift. We’re in the same dilemma. Our fireplace is in the center of the living room, so I can’t knock out a wall and have the open floor plan I’d like. And we have 4 bedrooms, but two are on the main floor and two are in the basement. I hated being separated from my parents when I was young and we moved into a house with a similar floor plan, so I want to move before we have a second. But my husband had 5 siblings, so they always shared rooms and having our future children share a bedroom isn’t a big deal to him. He would have loved a room in the basement away from everyone when he was a kid! Funny how our experiences shape what are MUSTS in a house. So we’ve decided to love it for now (just re painted the living and dining rooms two lovely gray shades), and are about to tackle our kitchen too. I’m excited to see your progress! As i posted above, I grew up in a 3 bedroom, 1 bath house, and much of the time my sister and I (18 months apart) shared a room. We had a single, older relative living with us in the 3rd bedroom. We also had a playroom in the (walk-out) basement, so we never felt crowded in our shared room. When we got to be pre-teens, my parents gave us their larger bedroom so we had more space for desks and were able to split the room into hers and mine. I don’t see a problem in not having a designated guest room. Most of the time it would be unused and could collect clutter, though I suspect you wouldn’t let that happen. 🙂 We have no kids, and our 2 extra (bed)rooms are used as an office and craft room, plus DH has a shop in the basement. Guests either sleep on a foldout in the office, or we give up our bed (when my elderly inlaws visited) or if they’re staying longer, we arrange a B&B. We once had guests for 5 weeks and we cleaned out and painted a shed for them to stay in. It was summer, and they were using us as a base for day trips. I love your decorating style. It’s so homey and inviting! Can’t wait to see what you do with the kitchen! It’s like a blank slate! I’m actually going in the opposite direction and am downsizing. We are in the process of selling our home (hopefully!) and once we do I’ll be looking at something smaller. With the kids grown this is just too much house for us! We (my husband and two year old son) live in a 450 sq ft 1 BR in NYC, so this is a topic near and dear to my heart. There are many things I hate about our situation (mostly the stealth ninja moves we’ve had to perfect to get in and out of the bedroom between 5-7am without hitting a creaky floor board and waking up our son), but the post you link to above discussing minimalism – that’s the key. For example, our living area has a long, narrow, bar height table that we use as an office space, a dining room table, and a social bar area when friends come over. And flexible divisions help too. We were able to create a folding / ceiling mounted room divider for the bedroom using things from Ikea. During they day, we can all share the sunlight, but at night, I can pull the curtain around my son’s “faux room” and the soft glow of our lamp (which is on a dimmer switch) through his curtain acts as a night light while we read in bed. Smart moves! 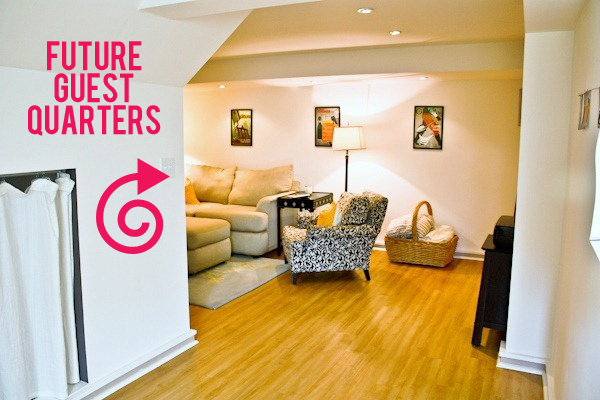 450 sq ft…that’s tiny! After I read Tiffany’s comment I also checked and I’m not following you any more either. Weird, Thought I’d let you know. It would have plenty of room with a twin bed. Toys are all through the basement. I don’t know if kids 3 to 4 years apart would be great roommates. They’d be on totally different schedules. ..esp for the first year. There’s exactly (to the due date, though I was a week late, she was a week early) two years, nine months between my sister and I (the family joke is that mum&dad made it to my second birthday, decided I / they’d survived babyhood and got started on my sister) and we shared a room from the time she moved out of a bassinet and into a crib until I moved out at 21. We were fine together, with the exception of a few squabbles in teen hood as we have very different thoughts on how tidy a room should be and I’m a night owl whereas she’s a morning person. But as kids, even little ones, we had no problems. Apparently I slept through her waking up as a baby etc. I can actually sleep through anything now so maybe that training as a preschooler was a plus? Our room was super tiny until we got a larger room when I was 5 so we never played in there as we had the sunroom for our toys so I guess there was no problem with me disturbing her during her daytime naps. Yikes! Perhaps we’d need keg locks! I’m sure many parents have master bedrooms on the first floor with kids upstairs so I’m not sure why a reverse floor plan would be so bad. Agreed… so many houses on the market advertise “FIRST floor master” so I don’t understand the big deal about being on different floors. Whatever set up works for you and your family is what works for you and your family. Homes comes in all sizes just like families, and people seem to grow up just fine sharing a bedroom with a sibling, having a small bedroom, or having one on a different floor or whatever. One of my good friends growing up was one of 4 children that lived in Flint Ridge apts. Their family had a 3 bedroom: Her brothers (8 years apart) shared a room, she and her sister (a year apart) shared a room WITH their grandmother and they grew up to be 2 lawyers, a school psychologist and a business owner. Your home is what you make of it, and as long as it’s full of love, you’ve got nothing to worry about. I agree with the grams! My granson is on a different level then where daughter and her husband sleep. It drives me crazy to think about.This was un heard of in my day. Love, love, love it 🙂 The only reason we’d move at this point would be for location — and I am already getting nauseous just thinking of trying to sell a house a couple years down the line with a toddler and newborn. Eeeeeek! I always love the photos I have seen of your place, so I think you’re on the right path <3 Right now, my mother-in-law is visiting (all week) and sleeping on a blow-up bed in our dining room. We make it work! I guess I am a horrible person and mother because all my four and 14 month olds have ever known is sleeping on a different level…dun dun dun…in a BASEMENT! Ha, but seriously. We had a main floor master in our first house, and after six-ish months in our room, upstairs our baby went. At our new house, which we chose with the long term in mind, we have a main floor master and three beds in our super bright walkout basement. The play room and family rooms are down there; it’s already the kids’ wing. When we have our third in the spring, the new baby will join his or her siblings when he or she is sleeping dependable stretches. I love the layout because having the master on the main floor makes it feel simple to grab things or get ready in the morning while being somewhat accessible to the breakfast action. At night, my husband and I have the main floor to ourselves and don’t worry about disturbing the kids. ETA: don’t know why I called her a four year old! She’s three! I work in a community servicing refugee families and in many cases whole families are sharing one bedroom apartments with 4-5 kids in one room while mum and dad sleep in the living area. They’re just grateful for a safe and secure roof over their heads where they can send their kids out the door to school without worrying that they’ll be killed on the way. Sometimes I think we all need to get a little perspective in our first world worries. Obviously it’s different if the children are different sexes (in the long run) and I can see a bigger age gap potentially being an issue too, but I think you have to wait and see with their personalities (I’m a planner too so I find that hard!). I’ll be interested to see what you do about the different level thing – we are converting our loft so thinking about the same issues. Totally love the attitude about loving your house while you’re in it! My husband and I bought our third house thinking we really needed room for guests (We lived in a touristy town). We ended up with a big expensive house. We bought our fourth house last summer (and I’m only 34!) and realized we don’t have guests that often, and kids can give up their bedroom! We saved so much money buying only 3 bedroom house, and my husband works from home too – from our master bedroom. Everyone’s different, but small make me happy. Oh Kath, I love your house, it has such charm. As for expanding I think you have it all figured out. James and I bought a 4 bedroom house for just us and our two dogs. My thoughts were that we would fill it up with babies, and it just got to be to big, and to much up keep for just the 2 of us. So we sold it. We now live in a two bedroom apartment, it is not ideal but it works. I have a guest room with a bed, and it is a craft room too. I call it the multi purpose room. When we have kids it will become a nursery and the stuff that is in there will go to storage. 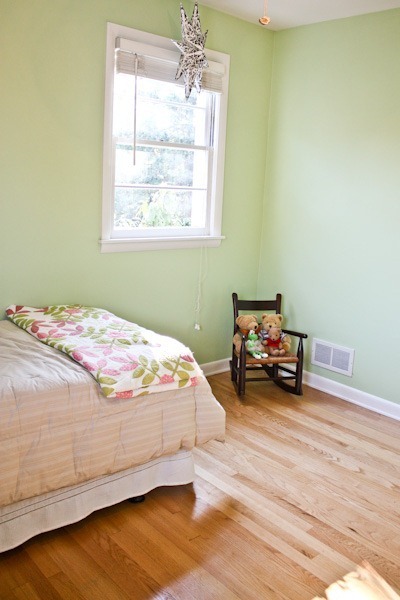 I will be keeping our twin trundle bed in there, because I just love your idea of having a bed in the nursery. Eventually when we have kids or get pregnant we will move to a house again. For now though I love our cozy little apartment. We are still making it feel like home, but it works. I love the little updates you did, it looks great. I cant wait to see the finished project. So many wonderful memories of raising our three in our little house! Location make such a difference also and I saw in one of your pictures a beautiful view, looks like you have a great yard! 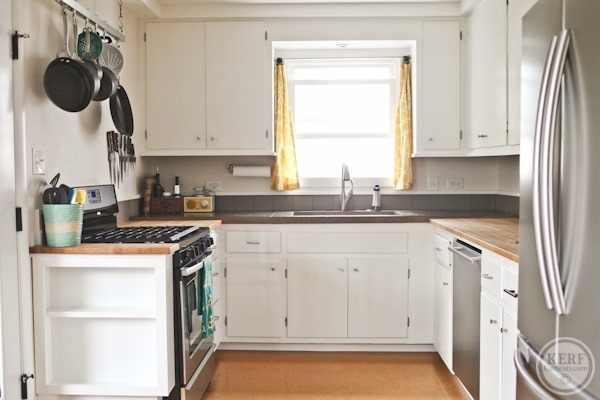 Quick question about your kitchen – what kind of countertops do you have now? What are you looking at upgrading to? We currently have white cabinets and black countertops (hate hate hate) and are looking at butcher block. If that’s what you currently have, how do you like them? We have concrete and butcher block and hate hate hate them!! Ha. We’re upgrading to quartz, which is known for its durability. I have a post coming up about why we dislike the current ones so much.